Four of these officers are said to have flagged ‘irregularities’ in the Rafale deal. The fifth was part of negotiations & is now auditing the deal. 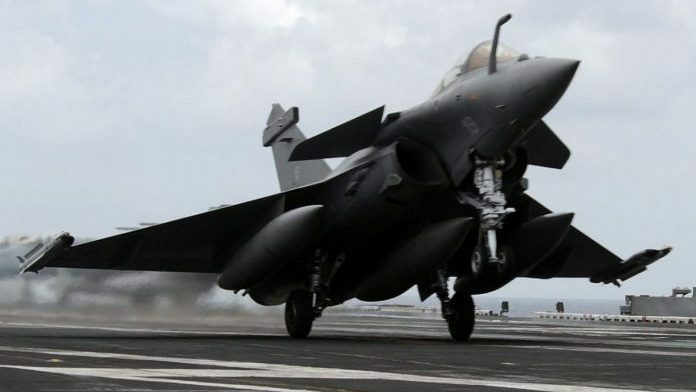 New Delhi: New revelations in the mounting Rafale scandal have claimed that several senior government officials had flagged alleged irregularities in the deal when the Modi government was negotiating the purchase of the fighter jets with France. Over the last few weeks, several official notes have surfaced in media reports and on social media, highlighting concerns around “parallel negotiations” and “interference” from the Prime Minister’s Office (PMO), the absence of sovereign or bank guarantees in the deal, and questions over the benchmark price. Some of the officials cited in these documents have since retired and have countered the allegations that are being made by opposition parties based on their comments in those official documents. ThePrint takes a look at four IAS officers and one from the Indian Defence Accounts Service who are at the centre of the latest controversies, their careers and their roles in the deal. G. Mohan Kumar: According to a report published in The Hindu, Kumar, the then-defence secretary, had raised strong objections to the PMO conducting “parallel negotiations” with the French government. According to an official note by Kumar dated 24 November 2015, these negotiations had “weakened the negotiating position of MoD and Indian Negotiating Team”. Soon after the report was published, however, Kumar came to the Modi government’s defence, arguing that the 7.878 billion-euro deal was “clean”, and that the PMO had not interfered in the price negotiations. Kumar, a 1979-batch IAS officer from the Odisha cadre, was appointed defence secretary in May 2015, and served for two years until May 2017. Originally from Kerala, Kumar spent two years as the secretary for defence production, before he was appointed defence secretary. Through his 38-year-long career, Kumar served in several central ministries such as steel, water resources and commerce. Asha Ram Sihag: A 1983-batch IAS officer from the Himachal Pradesh cadre, Sihag served as director-general in the acquisition wing of the Ministry of Defence (MoD) — an additional secretary-level post — from 2013 to 2015. Sihag had also signed the note by Kumar on the “parallel negotiations” by the PMO. Just one month after the note was sent, Sihag was moved out of the ministry and replaced by an officer from the PMO. This was just months before the deal was inked. Sihag was transferred to the UPSC, a move the Congress has alleged to be “a punishment” by the Modi government. Sihag is currently serving as secretary in the Ministry of Heavy Industries and Public Enterprises. Rajeev Verma: A joint secretary in Sihag’s team, Verma had reportedly raised concerns about the benchmark price, and put his objections on record, which is said to have led to a delay in the cabinet note approving the deal. Verma’s objections were subsequently overruled by the officer who replaced Sihag, and the deal was signed months later. In the meantime, Verma proceeded on a month-long leave. His note, in which he raised questions about the “high” cost, was sent to the Comptroller and Auditor General (CAG), whose report on the deal is now awaited. In 2017, Verma was moved to the Delhi Development Authority (DDA), where he served until November 2018. A 1992-batch IAS officer of the Arunachal Pradesh-Goa-Mizoram-Union Territories (AGMUT) cadre, Verma is now principal secretary and transport commissioner in New Delhi. Rajiv Mehrishi: Mehrishi, now the Comptroller and Auditor General of India (CAG), has been accused by the Congress of being “complicit” in the irregularities in the Rafale deal. While the much-awaited CAG report on the agreement is expected to be tabled soon, the Congress has now said Mehrishi must recuse himself from auditing the deal. The Congress has said that as finance secretary between 2014 and 2015, Mehrishi was part of the negotiations, and thus his role as auditor amounts to a conflict of interest. A 1978-batch IAS officer from the Rajasthan cadre, Mehrishi held several important portfolios in the central and state governments. Before retiring in 2017, Mehrishi served as the home secretary for two years. In 2014, months after the Modi government came to power, he was appointed secretary in the Department of Economic Affairs for 10 months. Mehrishi was especially brought in from his cadre into the ministry at a time when the Modi government had moved out UPA-II appointee Arvind Mayaram. At the time, Mehrishi was serving as chief secretary of Rajasthan. His other portfolios in the central government included the ministry of chemicals and fertilisers, agriculture, and the cabinet secretariat, among others. Sudhanshu Mohanty: A retired Indian Defence Accounts Service (IDAS) officer, Mohanty was serving as the financial adviser, defence services, in the MoD in 2016. In an official note, Mohanty had flagged concerns about the lack of financial guarantees in the deal, and said it would be “prudent” to release the money paid by the Indian government through an escrow account in the absence of a sovereign/bank guarantee. Mohanty has spoken out strongly on how the ‘letter of comfort’ that the Indian government settled for instead of the sovereign/bank guarantee was not legally binding or enforceable. For example, it does not make it binding on the French government’s successors to honour the terms of the letter. क्या फर्क पड़ता है मोदी जी बेशर्म हैं अब बेशर्म अगर रिश्वत खोर है तो कोई क्या करे ? I have read hundreds of columns by veterans, criticising the “ neta – babu “ axis in MoD, holding it responsible for all that ails defence preparedness. They claim to be the knights in shining armour, the repository of all valour, virtue, wisdom. How this file has been processed, what role has been played by whom, gives a more realistic picture. I congratulate the writer for calling it the Rafale “scandal”, because that is what it is. This is the first time I has seen it referred so, otherwise all the commentators so far have been calling it Rafale “deal”. Mr Modi’s interest in this high importance and high value contract is now obvious with the revelations of PMO’s involvement. Only thing that needs to be seen is whether he was so keen to oversee the developments in the interest of the nation, or in the interest of some individuals or private parties. The common perception points towards the latter, because Anil Ambani stands out as an awkward name in the entire scheme of things. Today’s INDIAN EXPRESS reports on the front page that two weeks before the signing of this deal, Anil Ambani had met officers of France’s Defence Ministry! Therefore needle of suspicion points towards Mr Modi’s extraordinary interest in propping this businessman of dubious success and financial records to the centre stage of the project. Was it in national interest? Especially when he was doing so at the cost of HAL which has a proven track record of manufacturing sophisticated aircraft for IAF, and which provides employment to thousands of Indians in various geographical locations. Due to government apathy HAL is today on the verge of a financial crisis.